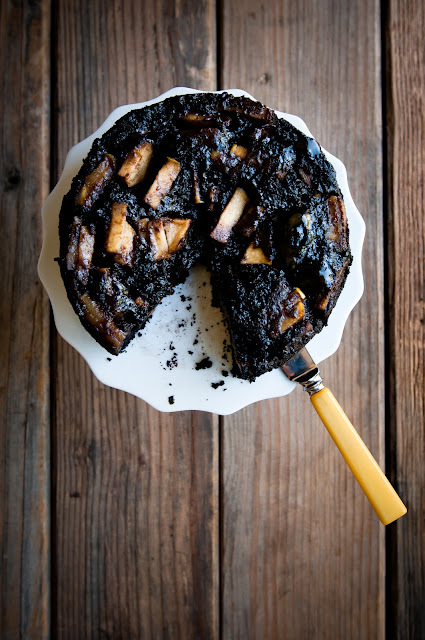 Desserts for Breakfast: Ooey Gooey Caramel Apple Blackout Cake, and Happy Blorgthday! and a Giveaway! 1. Grease and flour the bottom and sides of a 7" round cake pan (with at least 2" tall sides). Line the bottom with a piece of parchment paper and grease again. 2. 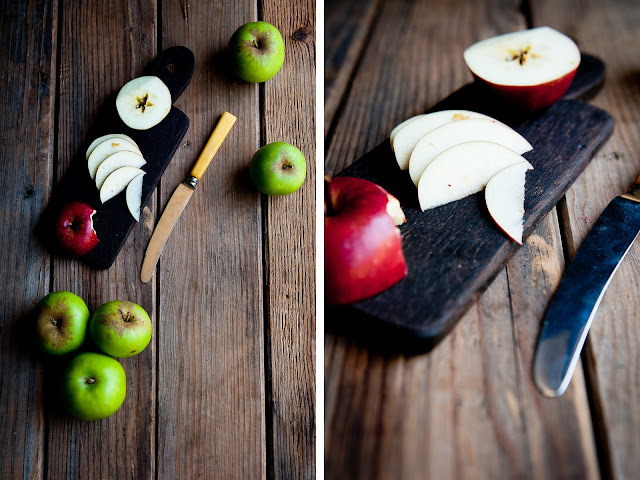 Peel, core, and slice the apples into chunks about 1/8-1/4" thick. Set aside. 3. In a light-colored saucepan (preferably with tall sides), combine the sugar and water. Stir to make sure the sugar is completely damp. 4. Over high heat, cook the sugar, without stirring but swirling the pan, until it reaches a light golden caramel color. Remove from heat immediately and stir in the butter until the caramel is smooth. Be careful--the mixture will sputter! 5. Pour the caramel into the bottom of the prepared cake pan and sprinkle generously with coarse sea salt. Then, line the bottom with apple chunks, packing them in as tight as possible. 6. Preheat the oven to 350 degrees F. If desired, line the outside of the cake pan with bake-even strips . 7. In the mixer bowl, combine the almond milk and cider vinegar, stirring briefly. Let sit for a few minutes until the milk is curdled. 8. Meanwhile, sift together the whole wheat flour, cocoa powder, cinnamon, baking powder, and baking soda in a separate bowl. 9. Once the milk is curdled, add the sugar, vegetable oil, and vanilla extract to the mixer bowl and beat until frothy. 10. Add the dry ingredients to the wet in two stages, beating thoroughly between each addition. After the final addition, beat the batter until smooth but do not overmix. 11. Pour the batter over the the apples in the prepared pan and tap the cake pan gently against the counter to allow the batter to settle. 13. Remove the cake from the oven and let cool on a cooling rack for ten minutes. Then, turn the cake out of the pan. (Don't forget to do this, as inverting the cake will allow the caramel to soak down into the cake!) Serve warm or at room temperature. 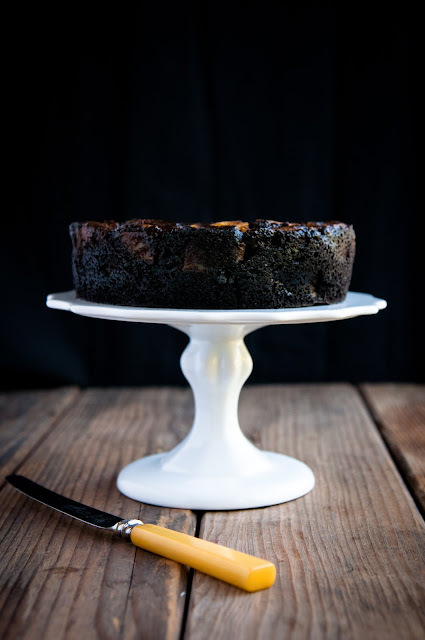 Tip: the cake tastes best when you let it sit for a few hours (at room temperature) before enjoying so as to give the cake time to absorb all of the caramel juices. You can briefly re-heat it so it'll be warm if desired. I'm also dyin' over this gorgeous cake! YUM! One thing in my daily life that makes me happy is waxed paper -- and sandwiches wrapped in it, specifically. I love the crinkle and the vintagey feel of unwrapping a sandwich at my desk at work. I just came across your blog, and I wanted to say that it's lovely! Your photos are fab, and congrats on the 1-year anniversary! You had me at 'ooey gooey.' I love how the cake is vegan and still looks delicious. One little thing that makes me happy in my daily life? Seeing the appreciative look on my hubby's face when I bring him a hot espresso as he wakes up. Happy Blorgthday!! 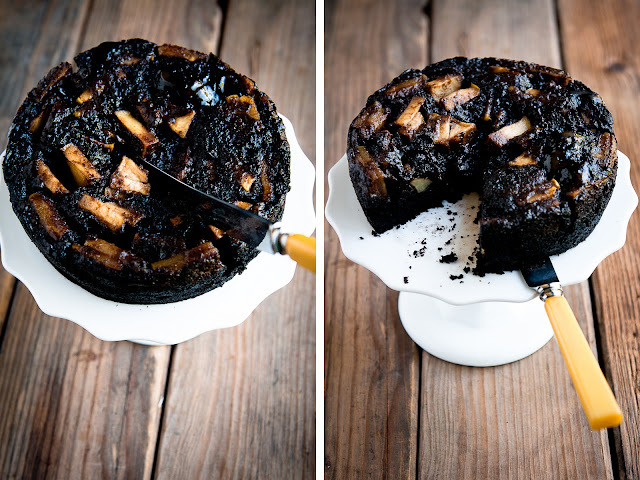 Love, love, love the cake ... definitely going to try it out once I get my hands on apples. My one little thing each day that makes me happy is cooking something that tastes amazing. I try to choose new recipes to try everyday so it is hard to know how it will turn out. The feeling of a tummy filled with good food just can't be beat! Happy, happy blorgthday! 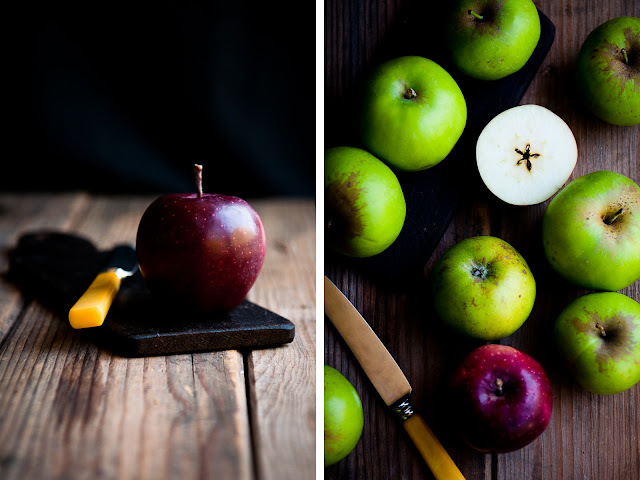 What a perfect post to celebrate a full year of beautiful and tasty blogging! I absolutely love your creations and am so honored to be one of the ones to have actually met you in person, thanks to this creative outlet called food blogging. Here's to many more blorgthdays! Duh, I forgot to answer the question. LOL. What makes me happy each day? When my little boy tells me, "mama, you look beautiful." Gosh, sigh. I WOULD LOVE TO WIN your giveaway!!! Love the Anthropologie latte bowls, you can't buy them in Hungary! Will bake this ooey gooey cake! What makes me happy? Being able to to say "goodnight, I love you" to my boyfriend who is Virgina right now. Stupid time zones. What makes me happy in my daily life? The one little thing in my daily life that makes me happy is the cup of Ka'u coffee my husband makes me each morning. That first sip is always an ahhh moment. Happy Blorgthday and great cake! Okay my answer is : Watering my little African Violet is one of those things that really makes me happy lately. Cooking and baking everyday makes me happy! So easy ;). Something that makes me happy every single day is eating something delicious. That and my loved ones. And cooking. And my shiny new mixer, glowing on my counter in front of me. The one little thing in my daily life that makes me happy is to come home everyday from work and watch my grandma cooking up a feast for the family with love and passion. I don't know why, but I never thought to pair apples and chocolate. I think you're on to something! Congratulations on shedding your blog arm floaties; must be exhilirating! And on to the one thing about daily life that makes me happy is when my fiancée asks what I want for "morning pie" (breakfast). I love all the photos of that cake and the deep color is just fabulous! Congratulations on your blogivesary! Who wouldn't love a cake that starts with Ooey Gooey Caramel. Happy 1st birthday!! What a momentous occasion!! I've enjoyed getting to know you through your blog this past year. I can't WAIT to meet you in San Fran!!! What a generous giveaway to celebrate your Blorgthday! One thing that makes me happy every day, sitting down in the evening after a days hard work to a good meal and family! This morning these pictures are making me happy. Absolutely beautiful! This looks unreal... definitely making this with my apple-picking-goods. Annndd in terms of happiness, morning routine of tea, Ella Fitzgerald, and NYTimes never fails to warm my heart. Coming home to my husband everyday! One little thing that makes me happy is knowing that I am around people I love! That is the best! I clicked through from Debra's tweet and am happily surprised! Beautiful photos, I love the dark edge...Happy Blogoversary! Right now, reading a few pages on the subway to work of a David Sedaris book makes me happy. I absolutely love your photos, by the way. Happy happy first blog birthday!! I just celebrated mine so I know how it feels... congratulations on your first year. Your blog and photos are absolutely gorgeous, Stephanie. So glad I met you and your blog!! What makes me happy? That one constant thing that makes me happy each day is my corgi's smile. Day in, day out, no matter what happened, no matter how horrible the day went, it always makes me happy when Stanford sits and stares at me and just smiles. Dennis and I are just so lucky to have found found and rescued him! Anyhow, go enjoy your day! And would love to make an outing to Tartine sometime soon! happy blogeversary!!! this looks incredible and like a good use of the black cocoa i have left! That is one beautiful cake and STUNNING photography! WOW! Great blog; so happy I found you! i can't wait to make this cake! a little thing in my daily life that makes me happy is my drive to work is straight east, so i get to drive into the sunrise every morning. I see you live in the bay area, so maybe you can appreciate this - I just moved to the Castro in SF (from the boring suburbs), so I am happy every day to walk through the rich culture that is in that area. I still have so many restaurants and cafes to explore in the area, too! Wow, reading this blog makes me happy. And planning for Halloween, for which I'm definitely making this cake! But aside from that, looking up at the mountains as I bike to and from campus never fails to make me happy and make me forget all my frustrations. Sunshine. Particularly sunshine lighting up leaves on a tree. Makes me warm inside and gives a skip to my step. Waking up to my kitten trying to play with my ponytail. It's so cute I can't help but smile. seriously - i wish you an awesome blog birthday. i for one am glad to have found you! you rock! In the morning I wake up and head straight to the shower to wake up...but the best part of my day everyday is while I'm in the shower my husband makes the coffee and sets it on the vanity waiting for me when I get out. It makes me smile every time. Thanks husband! This cake looks mid-blowingly good. I mean really. A daily thing that makes me happy - picking which tea I feel like today (I have a range on my shelf - Assam, Earl Grey, Her Majesty's Blend, Darjeeling, Winchester Breakfast, good old Yorkshire blend....) and brewing a pot full of it in my favourite bright-red teapot. I'm an addict! Wow! What a gorgeous cake....I don't think it looks bad at all. 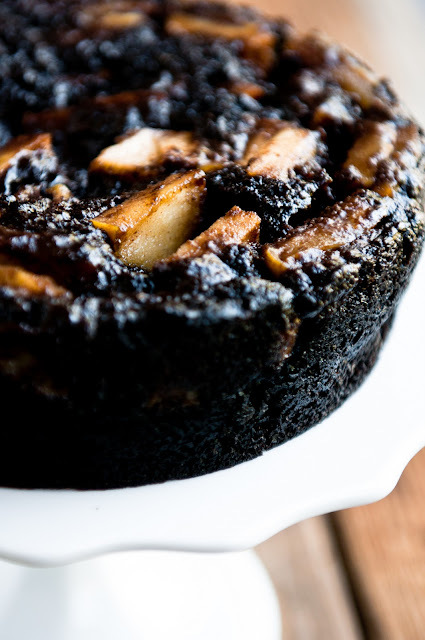 After all, what could be better than chocolate and caramel and cinnamon-y apples? Yum! The one thing that makes me happy in life is my family. I wake up for them, I cook for them, I am for them. I absolutely adore your blog - your photography (not to mention the food itself) is a continuous source of inspiration for me! As for what makes me happy on a daily basis, that would be the simple pleasure of making dinner each night. I love preparing new recipes and I find it so relaxing to create a meal. Thanks again for providing such amazing content on your blog, I love it. just found your blog and i love it!!! my friends make me happy and blogs :) oh and BIG coffee cups. What a wonderful and unique giveaway! Happy anniversary to your blog!! How lovely. I'm definitely making this. My daily early morning run really makes me happy. It challenges me, keeps me alert, and engages me in the day. Plus, it boosts my metabolism! One little thing in my daily life that makes me happy is my boyfriends really lame jokes. Seeing my daughter smile makes my day! Every day when I get home from work, my dog runs in circles and jumps around until I say hello to him. This small gesture makes me happy. I love reading cooking blogs. They make me wish I could bake and cook more often than I do and inspire me! Latte bowls make me happy! Especially when filled to the brim with a hot milky espresso. One thing that makes me happy in my daily life is hearing the church bells tell me what time it is. I live close enough to a church that I get to hear the chimes every hour, and although some people would probably find it annoying, I love it! Walking the dog in the cool crisp morning air makes me happy. Fall is the best. Happy one year! The rainy weather right now is perfect enough to make me want to curl up with a slice (or two...) of this cake and a cup of tea. One thing that makes me happy in my daily life is my morning cup of coffee. Simple, yes: I grind the beans fresh, mix them with hot water in my french press, and wait anxiously to taste it. Everyday, it is great to be able to smell the deep, dark roast... then drink it all up! My morning coffee routine definitely gets me through some pretty dreary days! Happy Blogrthday! I love the blog, I hope for many blorthdays to come! A little thing that makes me happy is chocolate and wine night with my girl friends, or as we like to call it Girlie Girlie Fun Time. The little moments with friends and tasty tidbits make life that much better, right? I just stumbled upon this blog from [simple song] and I've fallen in love with it! Happy blorgthday! It's my birthday today too! Congrats!!! :) I love reading your blog! Thank you so much for sharing your recipes! Friends, family, & laughter are truly what make me happy. I absolutely adore your blog! I check it every day! One little thing that makes me happy is when you bite into that perfect apple or peach (or whatever!) and nothing has ever tasted so sweet. The thing that makes me most happy daily is my little head rest, right between my boyfriend's collarbone and neck. Can't sleep without it!! Ending my day with a little dessert and reading in bed, (or checking out baking blogs in search of the next treat I'm going to make, like this amazing looking cake!). Happy Blogiversary! I know you said Blorgthday but personally I think Blogiversary runs off your tongue easier no? I have to guiltily admit that I actually save a lot of your food pictures to a folder on my laptop xD~ because the colours are so good.. although I try not to look at it :/ otherwise it'll make me hungry =_= and I am trying to lose weight. My daily happy thing is when my boyfriend looks down at me and says "look at you, cheeky" and smiles. Hello. I really love this blog. I just found it! Isn't that tragic..I mean, that I haven't seen it before this? Yes, I think it is.... :( Anywho, I think something that other people would consider menial in my everyday life, I treasure...Like my dog snoring in my ear in the morning. Yes, that's it. :)It makes me very happy. This cake is a knockout, Steph! Love that quote about seeing little things largely. I didn't really realize that our food blogs were "born" around the same time. Here's to an awesome second year that's even better than the first! I love your beautiful photos. Happy to have found you! So many things to be grateful for, but jumping into my bed at night is just sheer joy. No matter what's going on, I know that comfortable bed is just waiting for me! I am making that cake ASAP. Oh my! I think one of the best things during the day is when the hubs has come home from a long day and gives me the best "I missed you" smile and kiss. Makes my day every time. This cake sounds so wonderful! I'm going to the apple orchard with some friends this weekend, and I'm definitely going to mention this recipe to them. Wowwww. What a dramatic cake! It would actually be really nice for Halloween! ...my family around the dinner table each night - all my boys 3 kid-o's (one last one coming next month) and my fabulous husband. Congrats to your blog! Beautiful and tasty cake! My boyfriends undeniably happy self in the morning is my daily happiness! As for my little daily happiness, it's got to be sitting in silence each morning drinking my latte. Quite apart from the fact that I can *feel* the caffeine removing all the horrid "got out of bed on the wrong side" vibes, just being still and quiet and undistracted for a few minutes grounds me for the day ahead. Hello Stephanie, I just came across your blog today! I just subscribed and while I'm hoping to win my first giveaway, I'd say my daily happiness is music. Whether I'm a pianist, violinist, or just singing and dancing in my room every day, art gives me that gentle breath of peace I need in an otherwise chaotic college schedule. Did I mention how much I love your blog? Your photography is stunning! And this cake - THIS CAKE looks incredible! Thanks for the giveaway! And happy blog-birthday! Happy Blorgthday! 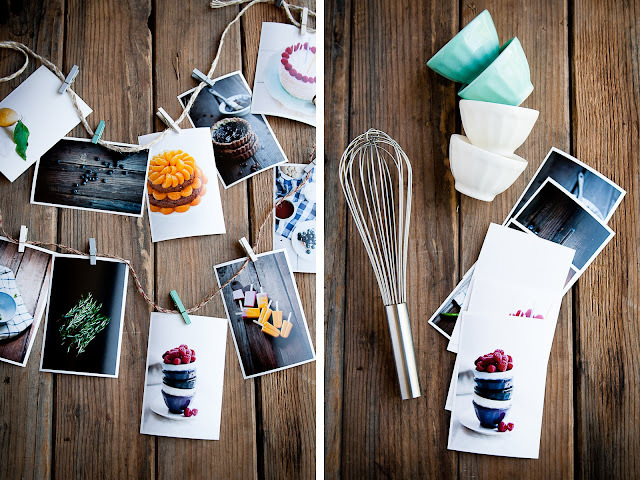 If your recipes are anything like your photographs then they will be BEAUTIFUL. I can't wait to try this cake out for my sister's *birthday* this weekend. My daily happiness comes from the thought of a warm, aromatic coffee. my favorite moment of the day is waking before my daughters and seeing them smiling in their sleep. i hope this never changes! My daily joy is, no doubt, sharing a cup of coffee and a bite of dessert (recently chai-spiced shortbread cookies!) with my girlfriend. Watching how different the light is in the morning when I go to work. I used to see a beautiful sunrise but now it's darker and darker which has it's beauties as well. this looks amazing. this is my first visit to your site - happy luck there's a giveaway! I little thing that makes me happy is talking to my sisters, since I'm in college now I've been seeing them less and less so just thinking about what to talk to them about brings a smile to my face! Happy Blog day!! The cake looks excellent. Waking up to my little kitties faces as they purr on my bed. They make me smile every day. The cake looks insane and delicious! That cake looks so good! AHHH I need some chocolate! Waking up next to the man of my dreams every day makes me sooo happy! I just might be the newest subscriber (came upon your about two posts ago) but late to the party or now, I'm not going to miss another post! Happy Blorgthday! 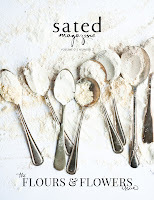 Ever since I came across this blog, I've bookmarked so many recipes to use for dinner parties. One thing that makes me happy is making crepes on Saturday mornings with my husband! One thing that makes me happy everyday is coming home to my dog. He is unconditionally happy to see me and is ridiculously cute. 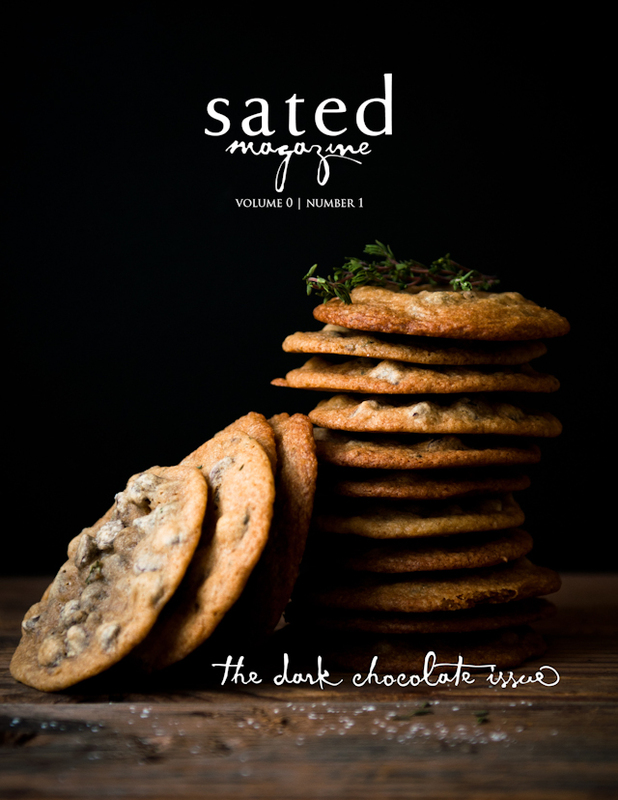 I just found your blog today thanks to Ill Seen, Ill Said (www.seenandsaid.blogspot.com) and I'm dying to try the s'mores cakelette! The thing that makes me most happy every day is waking up knowing I am working towards the life I've always wanted: full of creativity, love and a future career in librarianship. Congrats on your 1 year blog birthday:)!! It was really good to read how this blog really became your creative outlet, and that helped you to focus and sort thing out. I absolutely love your blog, and the crazy things you do with your dinner parties and catered events. It's really gorgeous. One thing that makes me very happy is reading through my blogroll everyday and slowly steeping myself in the inspiration I get from the variety of personalities and content each offers. Congratulations on your Blogiversary! Everything is so beautiful! Walking through my cute little town makes me happy everyday! I never realized before moving here how important a community is to me! Happy happy blogiversary! What a sweet giveaway. The one thing in my daily life that makes me happy is being able to sit down and have dinner with my husband at the end of the day. We dated long distance (him in CA, me in MD) for almost two years, and now we can finally be married and be together! It's wonderful. your pictures are so gorgeous! and they highlight your drool-worthy food oh so well! Coffee every single morning makes me happy. Great way to start the day. I just found your blog the other day and I've fallen in love with it! I can't wait to try some of the recipes. Happy Blogiversary! Learning something new every day makes me happy. I teach art in a creative arts school and the one little thing in my daily life that makes me happy is the excited little faces when I walk in a room. Naked cuddles always make me happy. I love Desserts for Breakfast. Happy Blorgthday! :) Cake looks delicious. The little thing that makes my day is drinking a big cup of coffee while listening to NPR. It's my few moments of calm before a busy day at work! Yum yum! 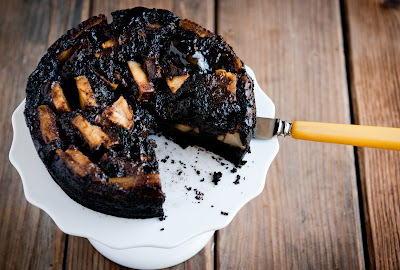 that cake looks like a great way to use up some of my CSA apple overload. One thing that makes me happy in my daily life is my adorable little kitty Molly, who's always ready for snuggles. something that really brightens my day is snuggling up to my new husband in bed; he's always been a little shy, but since we got married 9 months ago, he's become quite the snuggler, to my elation. @Laura S: Plain, unsweetened is preferable. Let me know how it goes! This cake satisfies all my cravings! Salty, tangy, and sweet...OH MY! All my friends and family enjoyed it. It's such a rarity to be able to satisfy everyone. Your photographs are beautiful as well! 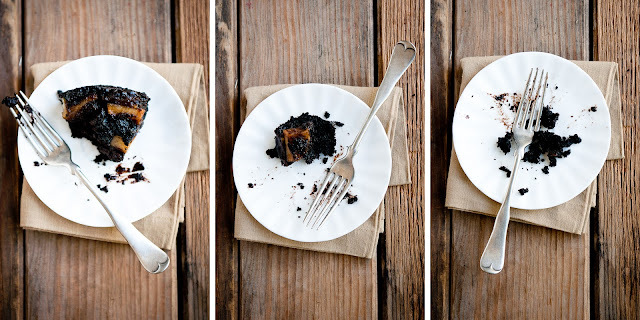 I just found your blog through flickr, and it was the photo of this cake that made me click on the link. Really, that is an amazing picture of what seems like an even more amazing cake. And vegan too! I can't believe my luck. I will definitely continue reading your blog and will make sure to make this cake sooner than later. @Tina: that's great! I love hearing that you enjoyed this cake! @Fanny: welcome to the blog! I just made this for our Halloween party! I can't wait to eat it :-) It's smelling really good in the oven already. @Anonymous: I'm sorry that the cake didn't turn out so ooey or gooey for you--it really does benefit from rest after baking so that the caramel seeps down into the cake.